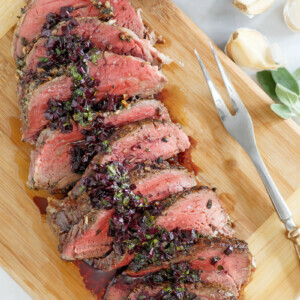 This roasted beef tenderloin is topped with an amazing sauce! Preheat the oven to 350°. Heat a large nonstick skillet coated with cooking spray over medium-high heat. In a small bowl, combine the sage, pepper, garlic, and salt; rub over the tenderloin. Add the tenderloin to the pan; cook 6 minutes, lightly browning on all sides. Heat a pan coated with cooking spray over medium-high heat. Add the shallots; sauté 3 minutes or until tender. Stir in the wine. Bring to a boil; cook until reduced to 3/4 cup (about 4 minutes). Stir in the broth; cook until reduced to 1 1/4 cups (about 6 minutes). Add the butter, stirring until melted. Stir in the parsley and 1/4 teaspoon salt. Serve spooned over slices of tenderloin.